An Ancient Partnership & the Fight Against Mold | 1-800-GOT-MOLD? Dogs have been helping Mankind for thousands of years. This prehistoric partnership began with joint hunting and protection, and continues today in ways our ancestors could not have imagined. Working dogs are best known for assisting the handicapped and working with police. Most people know that dogs are used to find missing people - dead and alive - drugs, explosives, guns and even arson accelerants. Less well known is their effectiveness at finding gas leaks, water leaks, bedbugs and termites. The use of dogs to locate hidden indoor mold growth still surprises some people, even though the practice originated more than 30 years ago in Scandinavia. It's also a point of occasional controversy. Finding hidden mold growth is not a problem for a dog; even humans can smell mold, to a limited extent. But what humans can't do is tell you exactly where that smell originates. A properly trained dog can pinpoint the source of the odor, and human tools can then confirm the presence of mold and diagnose the moisture problem that spurred the growth. The concern some feel about all working dogs is that their human partners are putting them in harm's way. The controversy surrounding mold-detection dogs hinges on the concern that dogs constantly exposed to mold will be adversely affected. After all, mold makes people sick. There are a couple of flaws in this argument, which is often advanced by those who feel threatened by the effectiveness of dogs. First, a responsible Mold Dog™ handler, such as those working under the 1-800-GOT-MOLD?® brand, will first survey a home or building without the dog to make sure it's safe, and to determine whether the dog's help is even needed. 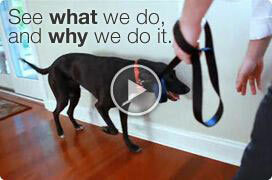 "Our dogs are far more than just tools," says Jason Earle, founder of 1-800-GOT-MOLD?. "They are healthy, happy, beloved members of each franchisee's family. Each dog is carefully matched for personality to her new human partner, and we only accept franchisees who love dogs. It's one of our first questions." Each dog receives about 1,000 hours of scent and obedience training before being paired up with her new lifetime partner. Each 1-800-GOT-MOLD? franchisee must then submit a veterinarian's health report every quarter, along with certifications of ongoing training. Any evidence of abuse or neglect of the dog is dealt with harshly - the dog is removed and the franchise is canceled. If a mold-infested environment is found, and mold is either clearly visible or if the air requires breathing protection for the human, the dog won't be brought in. The purpose of the dog is to find hidden mold; if it's not hidden, it's the dog's day off. If there is visible mold in one area of the home, the dog may be allowed to investigate other areas, providing the air is breathable. The second point is that when dogs sniff for a scent, they do it Clinton-style: They don't inhale. Inside a dog's very complex nose is a chamber where their 200 million scent-receptor cells reside (humans only have about 5 million). The dog sniffs just enough air to bring odor particles into this chamber, then blows it out again, purging for the next sniff, so it sounds like, "Sniff, sniff, whuff, sniff, sniff, whuff." Mold is a symptom of excess moisture. Mold and moisture problems often go unnoticed for long periods of time, not because no one cares, but because mold and moisture problems rarely show their ugly heads until they are well on their way down the path of destruction. By the time a mold problem becomes visible, what you see is often just the tip of the iceberg. Mold that is growing but is not visible creates gases (more on this below) that dogs can detect but humans cannot. Modern construction methods and materials can make moisture problems difficult to detect. Some building materials trap moisture, while others offer the nutrition mold needs to grow. Mold growth is often hidden away, out of sight. One would have to have X-ray eyes (or a Mold Dog) to find most of these problems in their early stages. • Even if the air sampling results show high spore counts, you still do not know where the source is located or how widespread it is. Another mold inspection would be needed to locate the source, and that inspection would likely be invasive and destructive - cutting holes in walls, for example. • According to the Institute of Medicine's study on Damp Indoor Spaces and Health, certain types of molds, such as the dreaded "toxic mold," Stachybotrys, create very few spores and/or sticky spores, which do not become airborne or stay aloft easily. This can prevent them from showing up in routine air sampling done during a typical mold inspection. • Mold spores within a wall cavity do not easily make it out into the occupied space in large quantities. Therefore, normal levels may be found through air sampling while a significant problem rages unseen inside the walls. Here again, the value of dogs comes into play. When mold grows, it produces three things. The gases molds emit are detected by the human nose as a "musty smell." In addition to producing an unpleasant odor, some of these gases are known health hazards according to US EPA and other authorities. Chemicals such as benzene, a known carcinogen, as well as methyl chloride, acetones and alcohols, are routinely found coming from active mold colonies. Unlike spores, gases can easily penetrate interior walls and build up indoors, creating discomfort and causing health complaints such as headaches, nausea, dizziness and fatigue. While this seems to complicate things, the gases themselves are the key to the solution. These gases need to be in fairly high concentrations for humans to smell them, whereas dogs can detect them at only a few parts per billion. At these levels, these chemicals may still have an impact on human health. Dogs have been trusted for hundreds of years to detect and locate things that humans can't find. Since 2003, the people at 1-800-GOT-MOLD? (and its predecessor, Lab Results,) have been using specially trained mold detection dogs (Mold Dogs), trained just like bomb dogs or drug dogs, to detect and locate the source of mold growth by detecting the gases mold growth gives off. "Mold Dogs give us the ability to quickly and accurately screen a building for hidden mold and moisture problems non-destructively," said Earle of 1-800-GOT-MOLD? "Once we use our four-legged mold detectives to help us locate the areas that need further investigation, we then use industry-standard tools and laboratory testing to confirm the dog's findings." "This enables us to zero in quickly on the trouble spots and define the location and scope of the problem with minimally invasive means, saving time and money for our customers." The bottom line is this: If you or someone you love is chronically ill, and especially if symptoms ease outside the house and get worse after returning home, hidden mold is a distinct possibility. Experience shows that the most accurate, least destructive and most cost-efficient method of finding hidden mold is with a trained Mold Dog, and 1-800-GOT-MOLD? is the pioneer in this technique.